2018’s been a transformative time in retail and ecommerce. The shopper is in the driver’s seat, enabled by technology to stay more connected and empowered than ever before. Their retail experience is on-demand, in-store, online, and anything but boring. “Everywhere commerce” allows consumers to shop however, wherever, and whenever they want. They’re making their way to you in person, online, by mobile, voice activation, etc. Basically, shoppers are coming to you however they damn well please, and there’s not a thing you can do about it, thank you very much. Across offline and online retail and ecommerce, disruption has enabled change. That change is geared to better serve more demanding shoppers and to redefine customer experience. But innovations and transformations are happening faster than ever. You’re used to balancing conventional performance metrics like growth, profitability, and space productivity. And you’ve got your thumb on the pulse. Competition? The market? No problem for a seasoned pro like you. That weakening pound might be worrying, but you’ve got this. And Amazon’s not that big a deal. And the 28% rise in administrations across retail in 2017 isn’t distracting. And the looming departure from the European single market doesn’t mean you’re losing too many logistics employees…yet. Yep, you’re doing just fine. Right? No? It’s okay to worry, especially with the Christmas shopping season around the corner. That’s usually the time you see your hard work pay off. That’s usually when you’re exceeding targets. That’s usually your marketing’s time to shine. Except Christmas is different now. And I don’t mean spiritually. Here’s the thing, back in the good ‘ol days, customers used to get in touch early in their research and path to purchase or ecommerce conversion. That meant that your sales team got to be part of their decision-making process. Then the internet. Then ecommerce platforms. Then content. Then payment processors. Then self-service. Then no contact, until they know more about you than you know about them. You’ve heard this all before. You don’t need a blog post by The Chat Shop to tell you that names like Boohoo, Amazon, and Alibaba are eating into your cred and bottom line. Those pesky industry disruptors like Amazon and JD.com actively forego short-term profitability in their quest instead for customer acquisition (taking your customers), topline expansion (eating your ad space) and retail dominance. Established and entrenched retailers (even those with a robust online and offline multichannel strategy) are at risk of losing customers and market share to these retail disruptors who are able to exploit organisational and operational agility this Christmas (and generally). The rules of retailing are being rewritten. You can succeed. 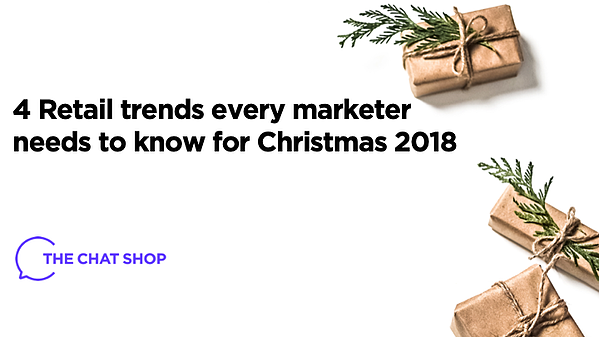 And with these 4 retail trends, you can disrupt your disruptors this Christmas. You, Marketing czar, won’t just keep up; you’ll be leading the retail pack and delivering Omnichannel CX that will provide on average 50% more leads and 10x your online conversion rate. You’ll get back an average of £12 for every £1 you spend getting ready for this Christmas. Make your Christmas quarter better. Get ahead of the competition. Forget the market. Disrupt the disruptors. With the rise of the internet, retailers saw an opportunity to drive sales through one extra channel: ecommerce. Most organisations viewed the internet as an experiment and made sure that their ecommerce channels were built separately from their traditional business. Because of this, most retailers still have completely separate on and offline entities (and company silos that go along with that). When customers started to use digital touchpoints during their shopping journey, they would interact with the same retailer across online and offline channels and encounter discrepancies. Price difference, brand promise, inconsistent service quality, and – the big one – no company understanding of who they were as a customer were all tangible problems. Retailers started to integrate experiences across channels and centralise customer information to provide personalisation, which we now call the Omnichannel experience. However, for organisations to deliver an Omnichannel experience, they have to break down the walls between online and offline functions within the same organisation (and often within the same team). This is a no-brainer. You’ve noticed that connected consumers became more demanding and expected instant gratification, convenience, and personalisation. To increase loyalty, retailers invested heavily in personalisation and delivering an experience based on their value proposition. But it’s fragmented: You own the website and (maybe) the ecommerce platform. Your customer support team deliver the brand to your consumers. And your bricks and mortar team deliver the in-store experience. Try though you might, it’s not seamless. Stores are a focal point for retailers again. Former online pure-players like Amazon and Alibaba are opening physical stores, bringing their online methodology to the ‘real world.’ These pure-players have traditionally run their business online, where everything is measurable and data drives decisions. When opening their brick and mortar stores, pure-players have kept this data-driven mentality and designed their brick and mortar stores accordingly. Most of these stores are equipped with technology that enables them to collect data from their customers and use this data to make educated decisions. GA enters the real world. Amazon, Alibaba, JD.com, Boohoo, ASOS. To understand their effect on your industry, you need to see the forest and the trees and even the roots of their disruption. Appreciating the journey that retail has taken will provide you with the right context on how and why you can beat them in Christmas.